The Comma Separated Value CSV format is a very easy to use and flexible format to save data to files. Many programs like Excel or Calc can import csv files and work with the data. In this article you find a possible implementation for Java for exporting CSV files. You may use this Java class in your code and adjust it to your use case. Below the code you find some useful hints on how to handle CSV files properly. You can take the following class and copy it into your Java project. Your data should exist in some sort of two dimensional representation like a two dimensional list. You may change the datatype of the implementation. Please note that we use the .toString() mehtod in the example code which may not always be the method of choice! The class CsvWriter is writing the lists one by one comma separated in one line. For every new list there is a carriage return line feed. //use an alternative to toString() if it is not implemented as needed. CSV is the acronym for Comma Separated Values. This name implies the main idea behind this file format: Data is to be written in a file spearated by comma as delimiter. But you may use any other delimiter than a comma. Another common variant is to use the tabulator "\t" as delimiter or the semicolon ";". Furthermore the end of a line (carriage return, line feed CRLF) has an important meaning in a CSV file. When looking for a delimiter symbol, make sure the symbol exists in the encoding you use to save the CSV file (UTF-8, ASCII, ...). If you can not avoid using a delimiter that my appear in your data (e.g. texts), then you can mask the data. Usually you may use single or double quotation marks to do so. A lot of programs offer import dialoges to import CSV files. 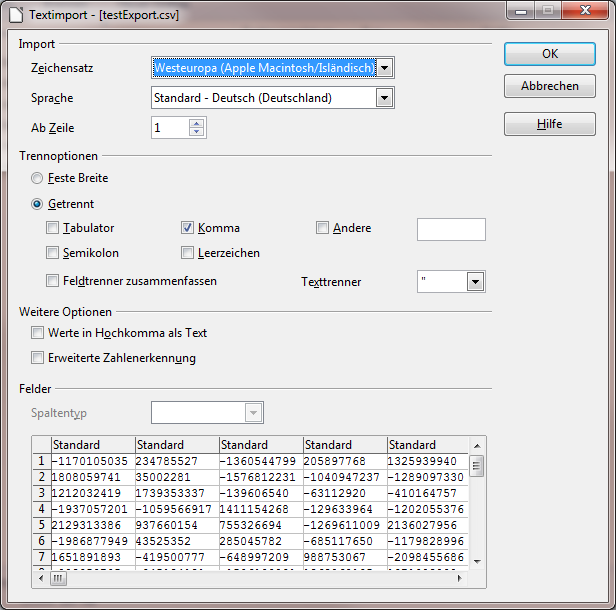 Like the programm Excel or OpenOffice/LibreOffice Calc you can open CSV files by simply clicking on them. Be aware that different programs may interpred a CSV file in different ways. Get to know about the conventions in a certain program first. On the left you can see the dialog that opens up when opening a CSV file withLibreOffice Calc. The preview helps to figure out the correct parameters for the import.